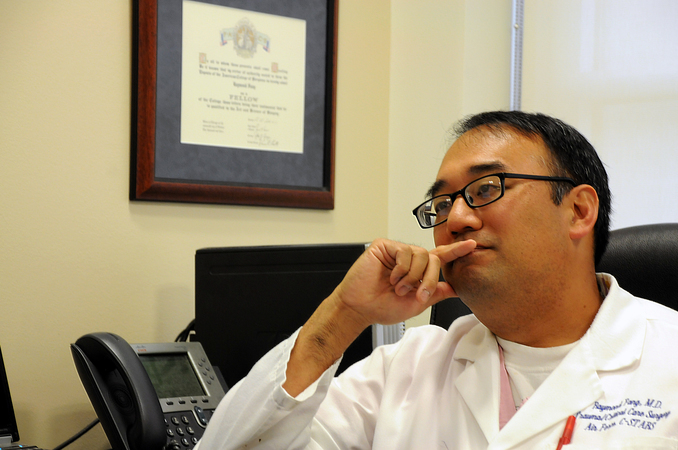 For seven years, Dr. Raymond Fang watched the steady stream of combat-wounded troops arrive in Germany from Iraq and Afghanistan. As a trauma/critical care surgeon at Landstuhl Regional Medical Center from 2004 to 2009—then chief of the trauma program through 2011—the Air Force colonel treated many of the most severely wounded warriors arriving directly from the combat zone. For many, their wounds were devastating—missing or mangled limbs, disfiguring burns and traumatic brain injuries among them. Fang said he “can’t begin to guess” how many patients he treated directly or whose cases he oversaw. He figures it’s in the thousands—fathers, mothers, sons and daughters who in past conflicts likely never would have survived beyond the battlefield. For Fang, the daunting nature of trauma care is much of its allure. “Every patient is a challenge, first to identify injuries and then to deliver the appropriate care in a timely manner,” he explained. “There are very few black-and-white decisions in trauma because no two patients present with the same injuries, underlying baseline medical conditions or response to injury. The constant challenge keeps me going. A family man himself, Fang said he forced himself to focus on the positive so he could cope with the emotional toll of treating troops suffering devastating wounds. Fang recognized advances made over the past 13 years have raised the state of military casualty care to levels once never considered possible. Of all combat casualties who reach a theater advanced treatment facility, 98 percent survive. The mortality rate for wounded warriors unable to return to duty is down to 5 percent, about one-fifth of what it was in World War II and Vietnam. “That’s the lowest rate we have ever had for military combat casualty care and people are justifiably proud,” Fang said. But like others in the military medical community, Fang isn’t satisfied. “Ideally, I would like to see it go to zero, but I know that is an impossibility because some of the injuries are so horrendous,” he said. Today, Fang continues pressing that standard as director of the Air Force’s Center for Sustainment of Trauma and Readiness Skills Program. “C-STARS” gives airmen preparing for deployments the chance to treat real-life casualties at the University of Maryland’s R Adams Cowley Shock Trauma Center in Baltimore. It’s one of the nation’s busiest trauma centers, where Air Force doctors, nurses and medical specialists get exposed to the kind of injuries they could encounter overseas. Classes rotating through the center are getting smaller to reflect the decreasing deployment tempo. But Fang sees the program as one of the important way to maintain expertise for the future, particularly in peacetime. Fang said he and others in the military trauma care community feel a sense of urgency in locking in these lessons now. “We all realize that now is the time, when there is still a huge focus on warrior care,” he said. “But we are all fearful that in five or 10 years from now, when the wars are history, that that momentum could be lost, and with that momentum, the money to support it. Fang looked back to 2001 and how relatively unprepared the military medical network was for the challenges it was to face. Likewise, the treatments provided weren’t consistent, and there was no way to track care delivered to patients from the point of injury through the full combat casualty network. The standup of the Joint Trauma System has helped institutionalize these processes and procedures by establishing guidelines and monitoring compliance and outcomes. Fang said he’s particularly proud of his role in helping introduce the system while at Landstuhl. There, he provided continuity between rotating medical teams downrange and direct patient feedback to his counterparts in the States. We all realize that now is the time, when there is still a huge focus on warrior care, but we are all fearful that in five or 10 years from now, when the wars are history, that that momentum could be lost, and with that momentum, the money to support it. Fang credits the system with pushing the envelope in casualty care in ways that apply not only to combat wounded, but also civilians who suffer trauma. “When people ask about the biggest advances in trauma care since 2001, most think of it in terms of medical techniques or new devices or medications. And certainly there has been a lot of progress in that regard,” he said. Fang expressed hope that this mentality will continue after the deployed forces return home. But keeping the momentum going – particularly in an era of austerity – will be increasingly challenging, he acknowledged. That, he said, makes it all the more important for military members and the American public as a whole to advocate to keep the casualty-care system strong. America’s men and women in uniform deserve no less, Fang insisted.